Each of us holds a vision shaped by experiences. Our experiences, indelible, personal, and vivid, change the vision of the present, of the past, and for the future. It is those experiences that develop that vision into something more tangible. Because it’s not what vision is, but what vision does. 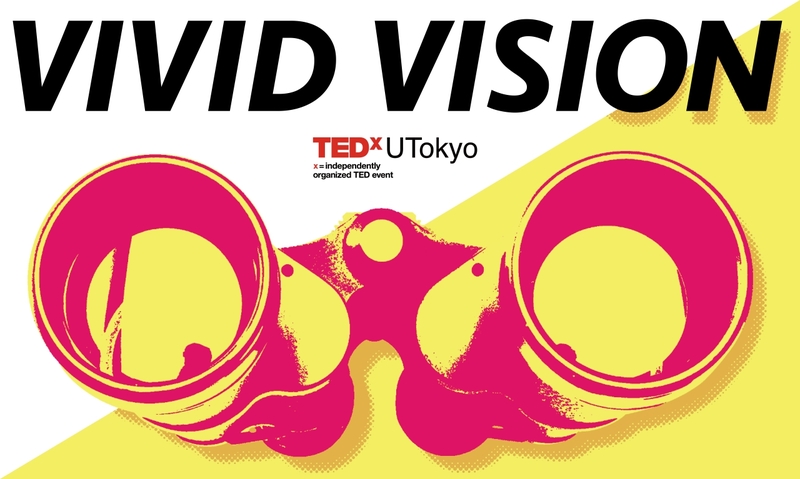 Through the passionate and soul-speaking talks and performances, TEDxUTokyo 2016 “VIVID VISION” will be transforming the way you perceive your world and its future. TEDxUTokyo 2016 isn’t just a speaker series event, it is also a place where the exchange of ideas goes beyond the boundaries of industries and disciplines. Throughout the event and all the way to the reception after-party, participants, speakers, and staff will get to freely explore new ideas together. Join us as we explore each vivid vision of the people around us. 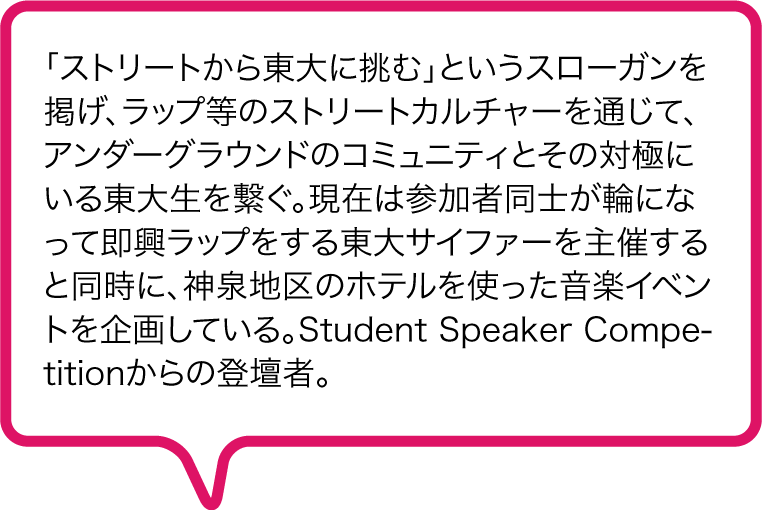 For the 12 or so Japanese speakers, we have an individual interpretation system that you can tune into for a simultaneously translated talk. A vocalist, violinist, composer and copy-writer from Australia. 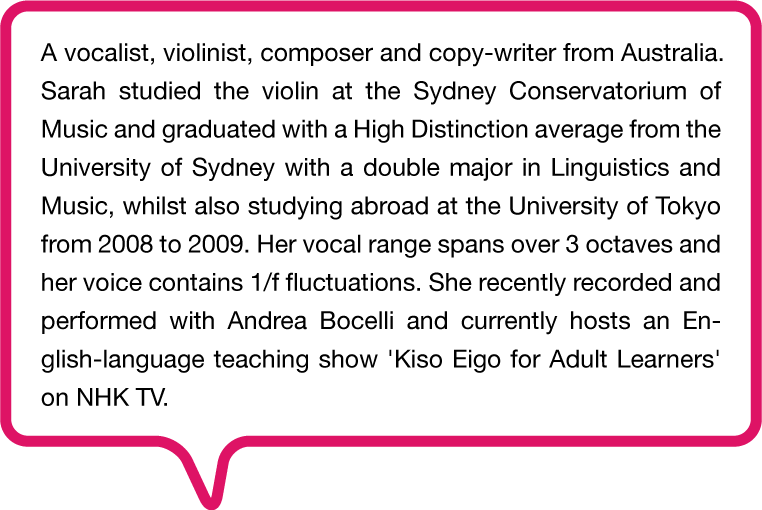 Sarah studied the violin at the Sydney Conservatorium of Music and graduated with a High Distinction average from the University of Sydney with a double major in Linguistics and Music, whilst also studying abroad at the University of Tokyo from 2008 to 2009. Her vocal range spans over 3 octaves and her voice contains 1/f fluctuations. She recently recorded and performed with Andrea Bocelli and currently hosts an English-language teaching show 'Kiso Eigo for Adult Learners' on NHK TV. While researching the enigmas of the mind and brain, Dr. Mogi is a critic of literature and the fine arts. 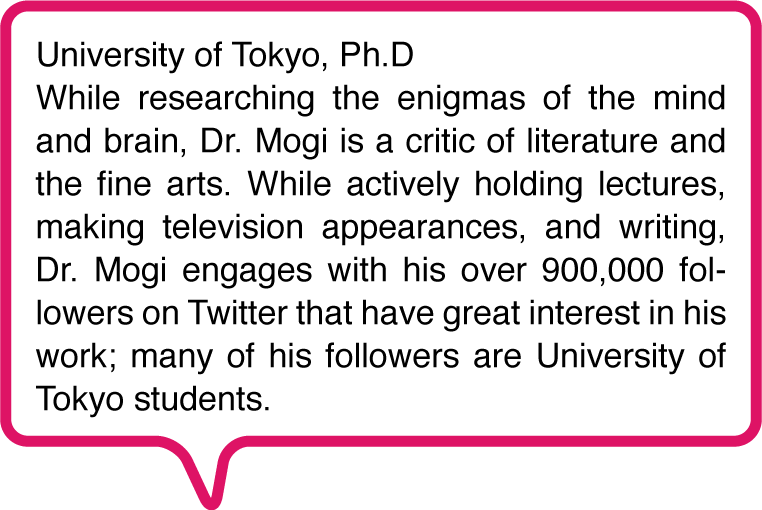 While actively holding lectures, making television appearances, and writing, Dr. Mogi engages with his over 900,000 followers on Twitter that have great interest in his work; many of his followers are University of Tokyo students. 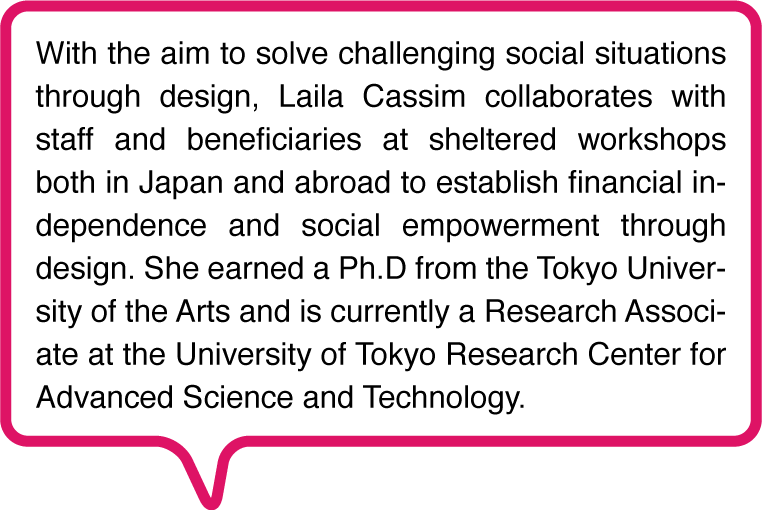 With the aim to solve challenging social situations through design, Laila Cassim collaborates with staff and beneficiaries at sheltered workshops both in Japan and abroad to establish financial independence and social empowerment through design. She earned a Ph.D from the Tokyo University of the Arts and is currently a Research Associate at the University of Tokyo Research Center for Advanced Science and Technology. 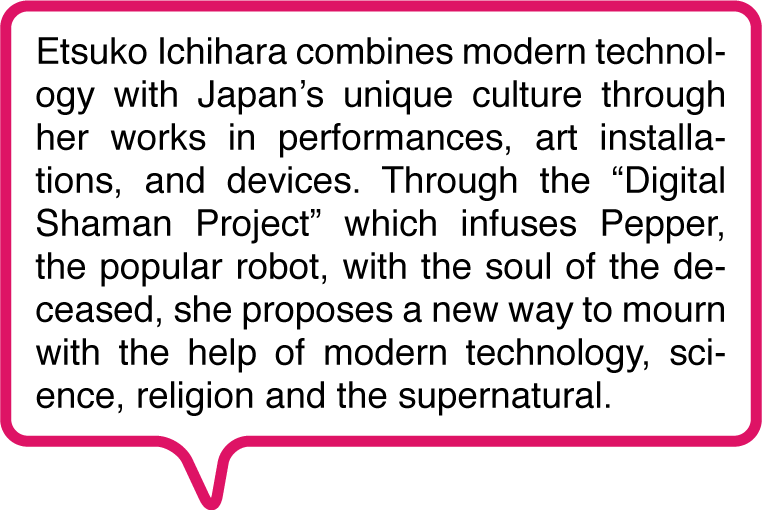 Etsuko Ichihara combines modern technology with Japan’s unique culture through her works in performances, art installations, and devices. Through the “Digital Shaman Project” which infuses Pepper, the popular robot, with the soul of the deceased, she proposes a new way to mourn with the help of modern technology, science, religion and the supernatural. 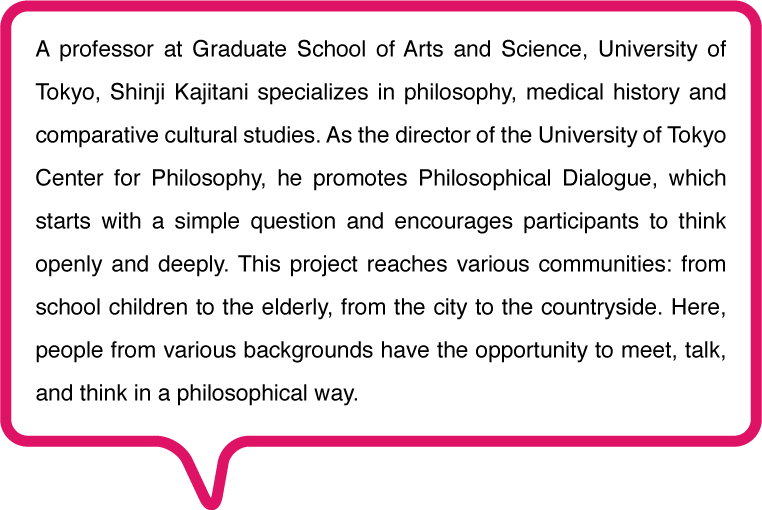 A professor at Graduate School of Arts and Science, University of Tokyo, Shinji Kajitani specializes in philosophy, medical history and comparative cultural studies. As the director of the University of Tokyo Center for Philosophy, he promotes Philosophical Dialogue, which starts with a simple question and encourages participants to think openly and deeply. This project reaches various communities: from school children to the elderly, from the city to the countryside. Here, people from various backgrounds have the opportunity to meet, talk, and think in a philosophical way. Maki Muraki has been an advocate for the LGBT rights movement ever since her student years at Kyoto University. Taking the rainbow colors, nijiiro, as its symbol, Nijiiro Diversity, founded in 2012, celebrates the diversity of gender through the colors of the rainbow. 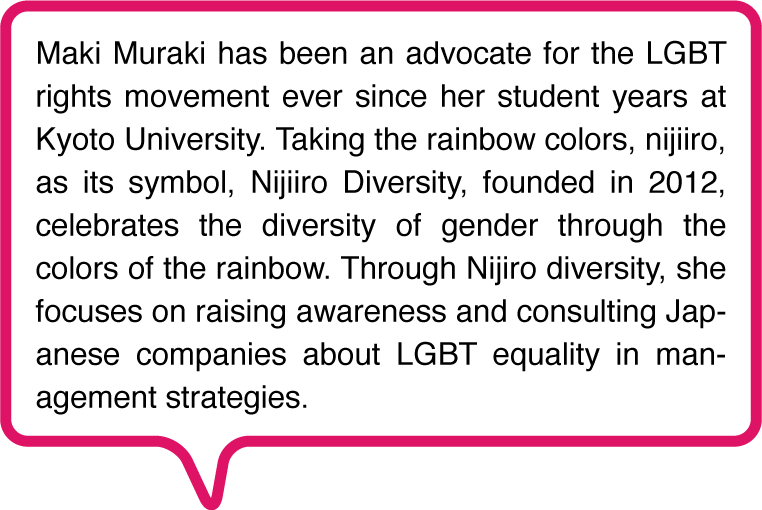 Through Nijiro diversity, she focuses on raising awareness and consulting Japanese companies about LGBT equality in management strategies. A passion for new ideas fuels Yu Makino’s interest in idea creation in IoT, like new techniques of using videos to build new concepts and marketing research. 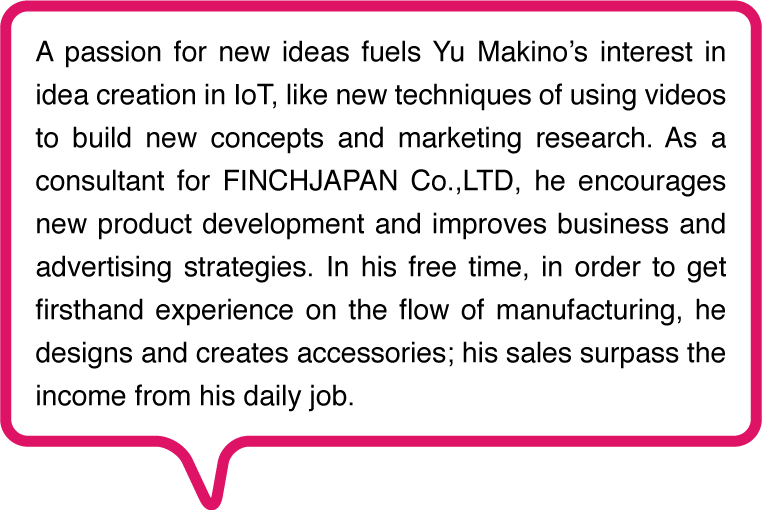 As a consultant for FINCHJAPAN Co.,LTD, he encourages new product development and improves business and advertising strategies. In his free time, in order to get firsthand experience on the flow of manufacturing, he designs and creates accessories; his sales surpass the income from his daily job. Round Glasses Wearing High School Female Entrepreneur. 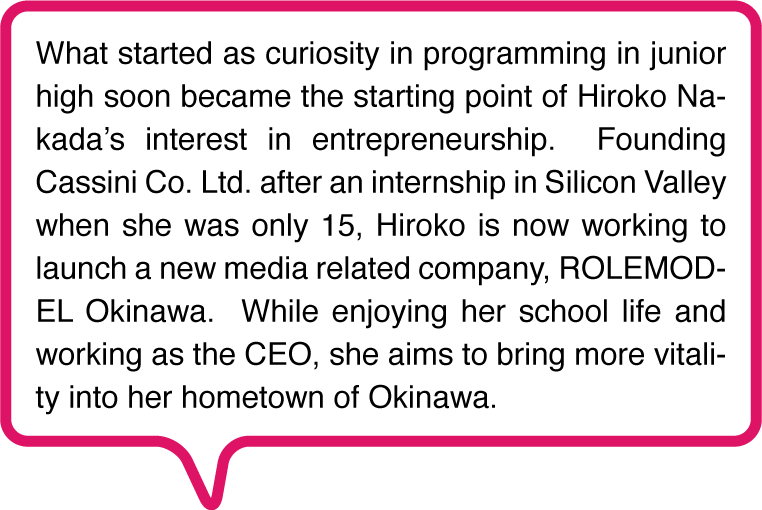 Hiroko Nakada / Round Glasses Wearing High School Female Entrepreneur. What started as curiosity in programming in junior high soon became the starting point of Hiroko Nakada’s interest in entrepreneurship. Founding Cassini Co. Ltd. after an internship in Silicon Valley when she was only 15, Hiroko is now working to launch a new media related company, ROLEMODEL Okinawa. While enjoying her school life and working as the CEO, she aims to bring more vitality into her hometown of Okinawa. As an associate professor in Materials Engineering at University of Tokyo, Professor Toshiya Sakata applies the technology of semiconductor transistor to biosensors. The super high sensitivity biosensors are capable of analyzing cell function and biomolecules by detecting molecules and ions in the living body. This is part of his pursuit for an easy and inexpensive way to noninvasively monitor a body. 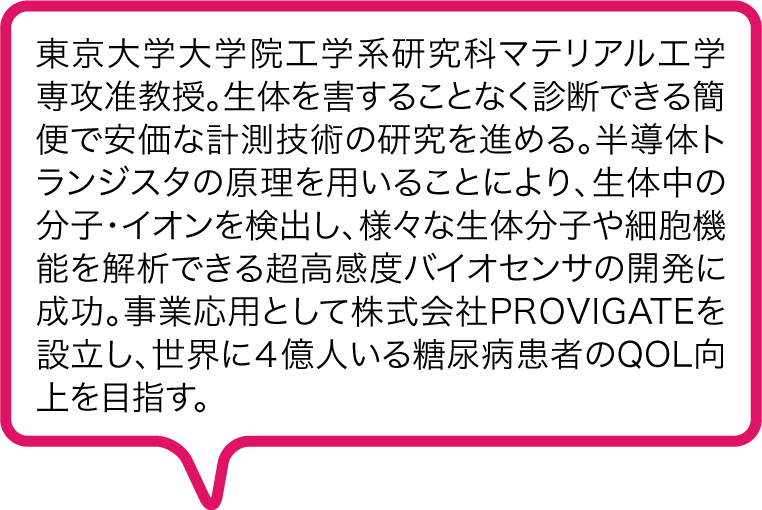 With this viewpoint, he founded PROVIGATE CO.,LTD, which aims to improve the quality of life of the 400 million diabetics around the globe. 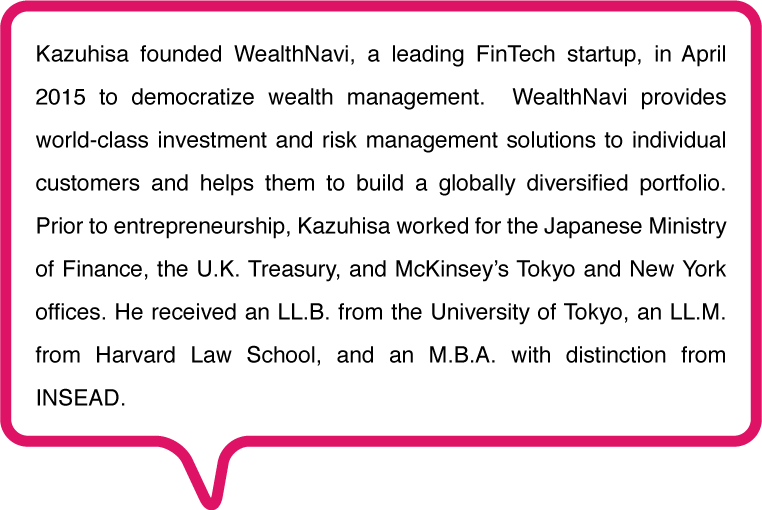 Kazuhisa founded WealthNavi, a leading FinTech startup, in April 2015 to democratize wealth management. WealthNavi provides world-class investment and risk management solutions to individual customers and helps them to build a globally diversified portfolio. Prior to entrepreneurship, Kazuhisa worked for the Japanese Ministry of Finance, the U.K. Treasury, and McKinsey’s Tokyo and New York offices. He received an LL.B. from the University of Tokyo, an LL.M. from Harvard Law School, and an M.B.A. with distinction from INSEAD. 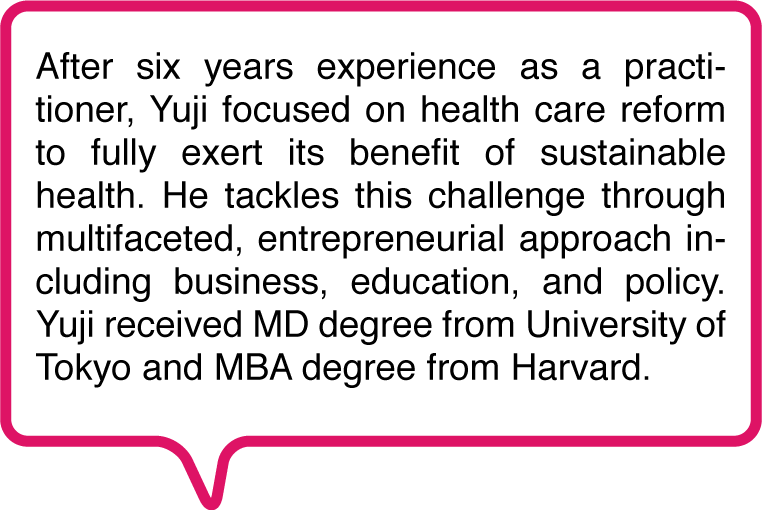 After six years experience as a practitioner, Yuji focused on health care reform to fully exert its benefit of sustainable health. He tackles this challenge through multifaceted, entrepreneurial approach including business, education, and policy. Yuji received MD degree from University of Tokyo and MBA degree from Harvard. Yossi 2 the future aims to create connection between two complete opposites: the underground community and University of Tokyo students. His motto, “Breathe a new life into UTokyo” attracts people to his ad lib rapping event, Todai Cipher. He hosts music events in hotels in the Shinsen area. He is the winner of Student Speaker Competition. 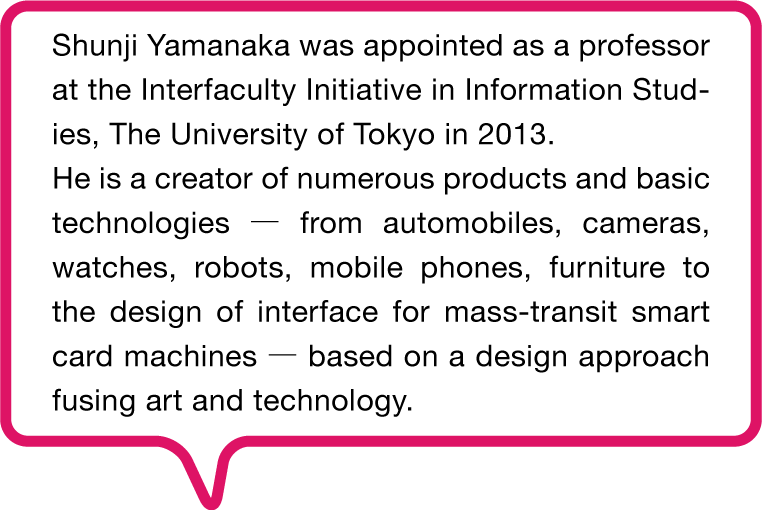 Shunji Yamanaka was appointed as a professor at the Interfaculty Initiative in Information Studies, The University of Tokyo in 2013. He is a creator of numerous products and basic technologies ― from automobiles, cameras, watches, robots, mobile phones, furniture to the design of interface for mass-transit smart card machines ― based on a design approach fusing art and technology. 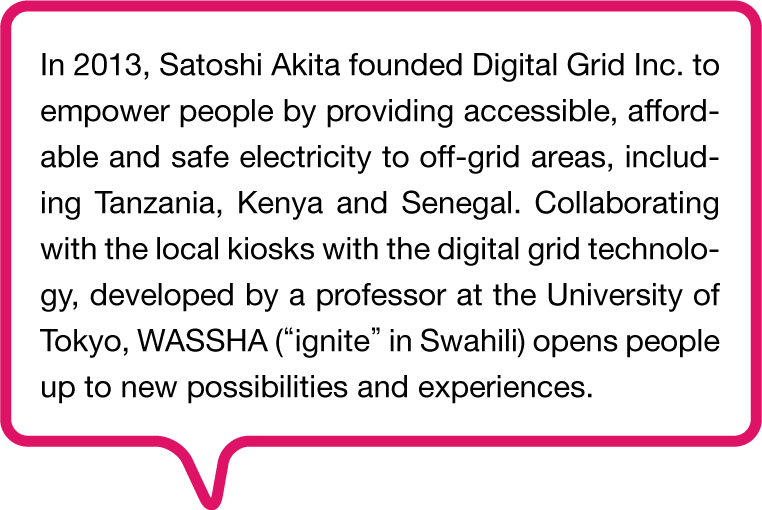 In 2013, Satoshi Akita founded Digital Grid Inc. to empower people by providing accessible, affordable and safe electricity to off-grid areas, including Tanzania, Kenya and Senegal. Collaborating with the local kiosks with the digital grid technology, developed by a professor at the University of Tokyo, WASSHA (“ignite” in Swahili) opens people up to new possibilities and experiences. TEDxUTokyo hosts an annual main event and biannual Salons. The main event are our large-scale, idea-oriented event. Salons, though smaller in scale, allows for more intense dialogue.